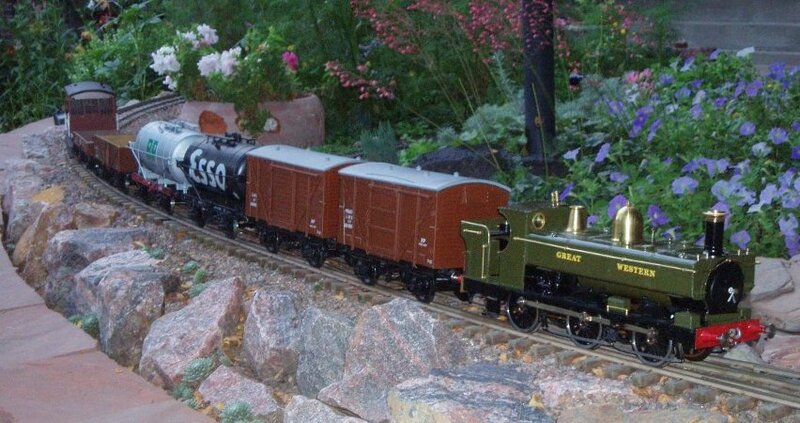 In September 2009 I purchased a secondhand GRS train comprising a live steam GWR 2021 and seven waggons. I made this purchase because I have a garden railway with both gauge 1 and gauge 3 tracks, but had no operable G3 stock. I shall not go into how this situation arose, but the GRS train seemed like a perfect solution - instant train! - all I had to do was hand over lots of money. The engine is very attractive, and a British goods train would be a very welcome presence on the railway. Also I would buy myself some time to do the other tasks that we all manage to acquire for ourselves, before building my own G3 train. A perfect plan. A plan which went wrong; but you knew that. Here is the train on the track for the first time, not in steam. The assembly workmanship turned out to be fair, and sometimes a little less than that. This has turned out to be acceptable except for how it plays sometimes with the main problem, the latter being the subject of these notes. And so I shall get to the ugly part of my reporting right away. To be nice about it, the engine has turned out to be a pile of junk. And the problems lie mainly in the design and manufacture, some in the assembly and fitting; as I think the reader will discover. It should be noted that my criticisms are of the engine as a miniature live steam engine, not as a model of the prototype. I imagine that the electric powered version is a very nice engine; but an actual steam engine brings realities that cannot be fudged. And the carelessness inherent in the production of this engine reflects on the suppliers, who sell, not give away, the equipment. The market is a small-volume niche, of course; so large engineering efforts are not likely to be feasible. But a poor product that frustrates the market does not seem to be a good idea. I was mollified to discover that I am not the only one disappointed by this engine. As examples, I list things that other people have written about this (live steam) engine. These comments mostly are from gauge3.org.uk or g3forum.org.uk; my comments are in square brackets. ... the sluggish performance which has been reported by other owners. I have read complaints of the poor performance of the GRS R-T-R model of the 45XX class Prairie tank which I believe is powered by a similar steam motor; one owner complained his model would not move the GRS Great Western 2-coach "B Set"! Beware I had mine built due to pressure of work and teh guy who built swore he woul never touch one again! ... and a roundhouse burner was fitted to avoid it sounding like a doodlebug! OK, enough of that odious stuff. However, in my experience there is too much truth in the words above. My first attempt at running the engine was just awful, and so I put in quite a lot of work right away trying to put things right. But I ran into time constraints - which was somewhat bitter given my decision to spend money to get an "instant train" - and had to stop. That was more than a year ago. But now I have found the time to have another go at it. I have had some success, and hope for more. And I have realised that I really owe it to myself and the community to record information, success, and failure. And the method I think will work out best is for me to record things as I go along, diary style, from where I am today. This will not produce a logically correct ordering of topics; but it will get information recorded. So the rest of what is here is something of a blow-by-blow account. I trust that the content will be interesting enough for the reader to see beyond misteaks, contradictions, and reversals. And I shall be strident in my criticisms since I think that will be healthy in the long run. I am determined to get resolution this time around. The engine is going to run or be scrapped. Yesterday I had the best run ever of the engine; but the run came in two pieces. This image was taken after opening the throttle the first time. If you look closely at the coupling rod pin on the front axle you can see that it is blurred. As soon as the throttle was cracked the front wheels started to turn, but nothing else happened. It was quite funny really; the engine appeared to be standing on level track with nothing holding back the engine other than its own weight and friction, spinning its powered wheels (The motor drives the front axle only). So, I re-installed the coupling rods, which involved drilling out a bushing. I have no idea why that was necessary, it seems that some selective assembly had been done before and I was correcting some fitting error. On the re-start, the engine ran around the track, climbing and descending 1:33 gradients, running through junctions correctly, and generally behaving itself, for the first time. Hooray! However, it would only do this if I ran it backward; running forward caused a couple of derailments. So here is where I am currently. The engine is running uphill toward the camera with about 45 psi boiler pressure (I checked the gauge earlier against a large industrial gauge, the small gauge read nearly 50 psi with the large gauge reading 55 psi). The engine has never done nearly this well before; and I shall describe how I got it to this point - but after addressing the wheel spinning and derailments. After the successful run I checked the position of the centre of gravity both with an empty fuel tank and with a full fuel tank - actually, faked with a cup of water. The balance point runs from about 3/8 inch to about 7/8 inch behind the centre axle with the fuel tank empty and full respectively. The screwdriver stuck in at the right side is holding up the wood for the image shot; the reader will just have to believe me that this is the, highly unstable, balance point. What is more, if the engine is running forward and uphill, bearing in mind that the water in the boiler will move to the back of the boiler, what is the weight on the front wheels? I have no idea, but I do speculate that this, coupled with a bit of compensation sticking, might be the cause of derailment. I am not convinced of this idea, but it is something to think about; and there is that, strange sounding, claim by someone else that "It derails if I allow more than 25 p.s.i." I wonder if running backward would stop that problem. I have found what I consider to be a fundamental flaw in the motor design. This flaw can be largely eliminated and evidence that this is an important issue comes from "before and after" bench tests on air, as well as the improvement in track performance under steam. In the bench tests, which were on a chassis that had some tight spots and other unsmoothness, the air pressure required to keep the engine idling went from the 15-18 psi range to a, steadier, 8 psi. The problem lies in the porting of the motor. 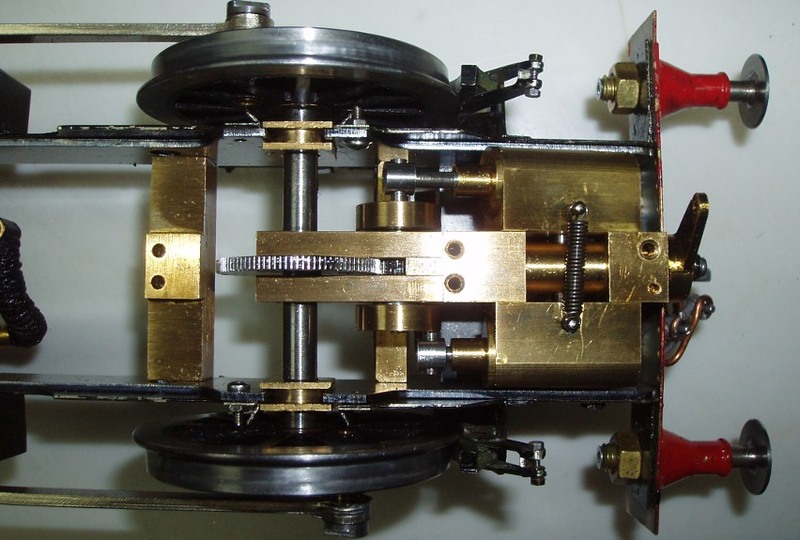 A common fundamental design objective in an oscillating engine is that there be instantaneous no-flow at dead centre, but in all other crank positions the cylinder be either consuming supply pressure steam or discharging to exhaust. Satisfying this objective can be achieved by having port diameters (ports usually are round) so that at dead centre the perimeters of the ports are line-to-line; and this, also, is usual. By line-to-line I mean that, if you could see them, the ports would look very similar to OOO, but with the edges of the Os touching. The ports from one side to the other of this simple diagram would be supply, cylinder, exhaust; with supply and exhaust in the fixed portblock and cylinder in the oscillating cylinder block, and clockwise rotation looking at the text diagram. If the no-flow design objective is not followed by having the ports too small then there is a part of each cycle of the engine where the cylinder is sealed but the piston is moving. This means that the cylinder (with piston) is compressing the exhaust followed by expanding it again. Even if these two actions cancel to some degree they will not be as powerful as using this part of the cycle to exhaust completely and start a new power stroke with fresh supply steam. Furthermore, the steam flow into the cylinder will not be as great as it would be with a larger port; and this will reduce the pressure in, and hence the power from, the cylinder. The extent of the power reduction needs analysis to establish its magnitude; but, intuitively, the ratio of the port diameter to the cylinder diameter will be a major factor. If the no-flow design objective is not followed by having the ports too large then there will be a part of the cycle where there will be a direct leak from supply to exhaust; which is wasteful, and also cuts down on the length of the power stroke. The geometry and trigonometry required to design or analyse an oscillating engine are quite straightforward and are all that is required. Steam expansion characteristics, for example, are not significant simply because of the (wasteful) consume-discharge cycle of the oscillating engine. The only important analysis improvement over the past forty years, since geometry and trigonometry have not changed, is the ability to mechanize the calculations with a computer; which permits the glorious, luxurious, ease, of "what if" calculations. However, an evening spent with paper, pencil, and a cup of tea can produce instructive and satisfying results. In the motor that I have, the ports in the portblock and the cylinder were 0.054 inch diameter (#54 drill bit). My measurements of the hardware and subsequent calculations assuming the instantaneous no-flow criterion give 0.078 inch diameter (#47) as the design target. So I convinced myself that the valve events for the engine were poor. Also, probably the steam flow was constricted excessively since the area ratio of the two port sizes is more than 2. I note that a common port size for oscillators with cylinder bores in the quarter to three-eighths inch (6-10 mm) range is 0.063 diameter (#52). And I have an 0 gauge engine with a single-cylinder, double-acting, 1/4 inch bore, oscillator, that, in the early days before I put a throttle on it, would run at 8 mph (about 5000 rpm for the motor); and that has 0.078 diameter (#47) ports and passageways. The first thing that I did to my motor is open up the ports to 0.078 diameter (#47). That is twelve ports, two on each cylinder, eight on the portblock. The objective being to change the valve timing to correspond to the instantaneous no-flow criterion. This was the only thing done between the "before and after" bench tests referred to earlier. Re-working the ports on the motor must be done carefully. The main problem is that twist drills "grab" so easily in brass under the conditions that pertain here, and they can vandalize an existing bore instantly. It is important not to use a drilling machine or power tool to do this job. Also, to avoid stripping down the block and cylinders it is important to avoid letting swarf fall into the engine parts. I proceeded by holding the workpiece in a bench vice with soft jaws with the portface angled down from the vertical; the idea here being that swarf would fall out-of rather than in-to the workpiece. Then I put a #47 drill bit into a pin vice and tightened it hard, I did not want the drill bit to slip part-way through the operation. I did not use cutting oil or anything similar; but I do not know if that was the best decision. I pushed the pin vice gently to start the cut - as square to the portface as I could - and just as soon as the drill started to bite, around half a turn, I pulled on the pin vice whilst continuing to make the cut. Another couple of turns saw the drill bit come out of the brass, and there was a counterbore about 1/16 inch deep. I checked for swarf in the hole and, in a couple of cases removed some with a dental pick. All the holes had a small volcano crater on the portface after the re-work; but it was easy to touch up with a honing stone - I used oil this time - and finally wash off the portfaces with naptha, alcohol, or something. The image shows the counterbores in the ports quite nicely. The one on the left appears to be a little deeper than that on the right. This difference is not important so long as the depth is adequate to allow free steam flow. Comparison of the equations of the port area and the cylindrical area of the counterbore gives a depth of a quarter of the port diameter for equality. But the requirement is more complicated than that. My guess is that anything greater than 0.04 (1 mm) is plenty. Definitely it is not worth the risks in taking a second cut simply to even up the depth. On the workbench, I made big picture decisions about how I should proceed with modifications and configuration of the whole Pannier Tank engine. Amongst other things I decided that the minimal running configuration should include the frame overlay. The reason for this decision is that the overlay provides the horncheeks and I guessed that the lack of these was at least partly the cause of binding of the compensation, leading to derailing. Also decided was that the superstructure, other than the overlay, should not be necessary for running. This decision requires elimination of parts of the superstructure from the runable configuration. In particular, the rear of the engine requires modification since, as designed, the gas tank has to be mounted after most other assembly. In general, the cab area is somewhat jumbled in the design. The status of the port modifications: are these adequate to declare the motor powerful enough, or do I need to delve deeper and see if the passageways can be opened up? Has the re-work of the compensation and fitting proper axle spacers solved the derailing problem? What is the status of the boiler steaming capability? A Roundhouse burner is on its way, but how much am I depending on it to solve steaming inadequacies? This replacement burner has been purchased to solve the noise problem, am I expecting too much effect on the heating performance, if so what is the boiler solution? My feeling was that satisfactory answers to these questions would convince me that I am able to make the engine usable, without making unrealistic expectations. So I did another track run yesterday. Needless to say it did not work out to plan; but, happily, possibly was better than expected. I ended up with a list of things in my head that I considered must be done to the engine, all feasible I think, which would yield a good result. What follows is an attempt to capture that list. The list is long, but fits with a gentler schedule. But, first, a picture; the engine is shown in minimal running configuration, hauling seven waggons, uphill. 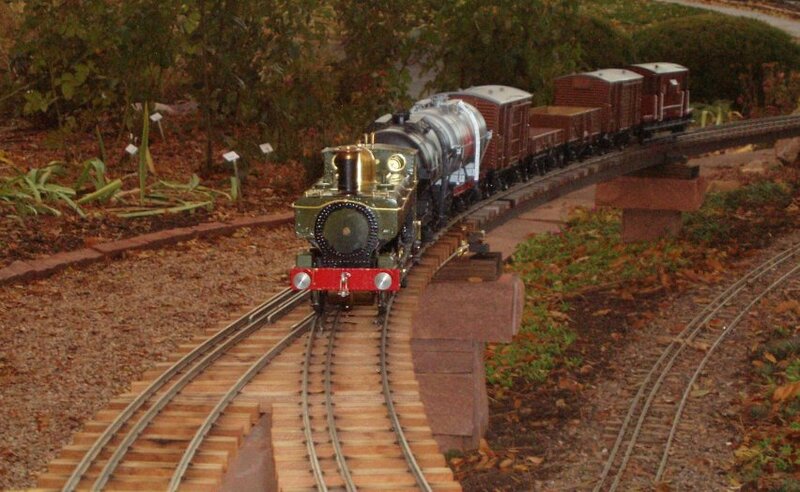 The engine not only started a seven waggon train on the level, but it would start the train on a 1:33 uphill gradient. Thus I am content with the port re-work, and deem that further investigation of the motor is not necessary. Speed on other parts of the track, admittedly mostly level or downhill, was more than adequate; this also suggests that the motor passageways are acceptable - not necessarily right, but not worth playing with either. Actually, the current performance is becoming a little difficult for me: I am beginning to wonder if it really was as bad before the port modifications as I have been claiming. I am very glad that there is a record of others finding performance lacking. The motor needed 30 psi (2 bar) to perform as noted above, and also to take the 1:33 hill with a running start, i.e., as part of normal running around the track. 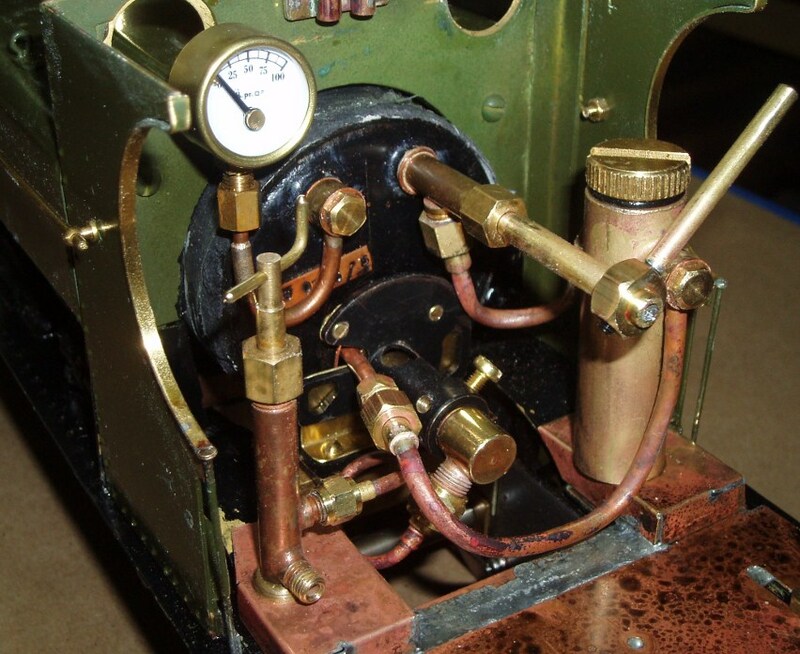 The effect of steam pressure variation was very noticeable, and close: a needle width above the 25 psi line (miniature gauge), and the train would make the hill; a needle width below the line, and it would not make it. It appears that this engine wants to be run at high pressure; I recall 45 psi (3 bar) being mentioned somewhere on the G3 forum; this appears to be a good target pressure for a responsive engine. The motor quickly cools off and becomes sluggish and messy, throwing around oily water. Superheating the supply with a stainless line through the burner flue, Roundhouse-style, is worth looking into. Lagging the motor might help, but I think probably is impracticable. Radio control is necessary on my hilly track. The train did run around with no throttle modification whilst running, hence slow uphill, fast downhill; but I do not like scale 200 mph goods trains, nor excessively toy-like behaviour. Sporadic hestitation was noticed; I think that this is binding of the coupling rods or somesuch. There was no noticeable change in the derailing problem; I was afraid this would be the result since I knew that I had done a good job of cleaning up the compensation, etc., the first time around. However, the nature of the problem came into sharper focus as a result of running this time, which was in the light of the weight distribution balance measurement. First, I note that almost all of my track is in good condition, with smooth, accurate pointwork and free of derailing tendencies during normal running. However, the sun has wrecked a multi-span wooden bridge, and the bridge is due for replacement. The damage manifests itself as a scalloping caused by each span drooping downward in the middle. And that results in three crests with five feet spacing along the length of the bridge. This trackwork is below acceptable standards and does cause problems at times with gauge 1 running. If the Pannier Tank is run backward there is no derailing, nor hint of derailing, running in either direction, at any speed, over the poor track, nor anywhere else. If run forward, the engine derails every time at the worst track crest, and sometimes elsewhere. Although I think that, when derailing occurs elsewhere, it is because the wheels already have been displaced on the known troublesome track. Derailing in other places always has been physically close to the scalloped bridge. It is quite clear that the engine suspension, including compensation, works properly running in one direction and not in the other. The sticking problem referred to before, and which still can be produced on the workbench, is a red herring. That problem can be produced only at the full extent of compensation travel and must be done by lifting one corner of the engine, so that the axles are cocked from side to side. The binding that occurs is a result of this misalignment which jams together the moving components; the jam will free fairly easily with some correcting pressure or tap. The necessary conditions for jamming do not occur when running. I do not have a good image showing the scalloping; but the reader may be able to see the effect in the image below. 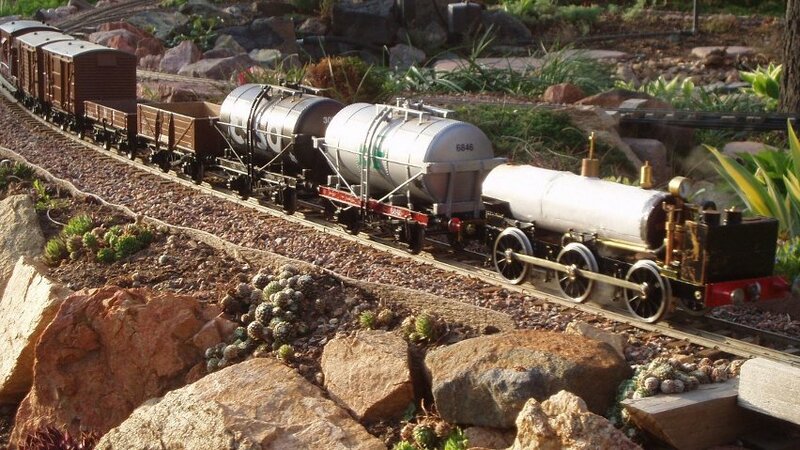 The Esso tank waggon appears to be going downhill, whilst the following five plank waggon appears to be (and is) going uphill. This is happening at the worst scalloped crest. By looking at the image of the balance check that appears earlier it is fairly easy to see what is happening when the engine derails. When running backward the centre of gravity is between the leading and centre axles, and the load on the compensation pivot forces down the compensation (which is quite free to move) and the leading axle, and this keeps the leading wheels on the rails. Hence there is no problem. When running forward these two factors also keep the centre and (now) trailing wheels on the rails; but the centre of gravity is just too far back to force down the front of the engine quickly enough, and the leading wheels are launched into space. Correcting this problem seems to require getting the centre of gravity further forward than it is currently in order to get more weight on the front wheels. 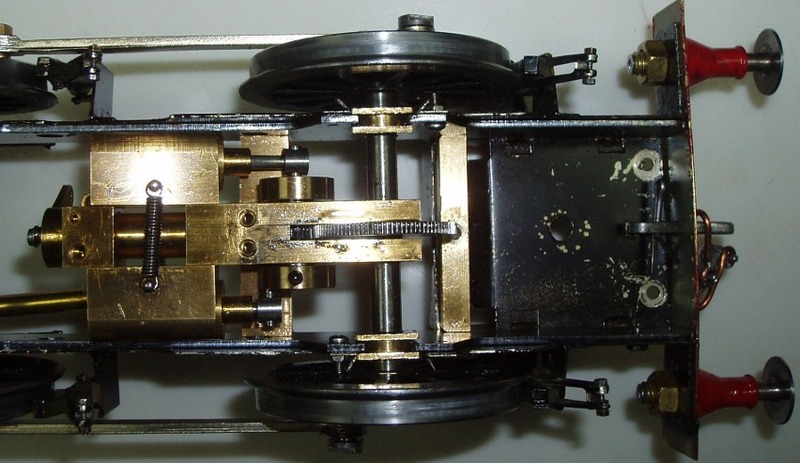 One possibility is to rotate the motor so that it is in front of the front axle; but this would make the motor poke out beyond the buffer beam. However, rotating the motor also would make a superheating line through the burner flue a simpler installation. Chunks of lead also come to mind for weight re-distribution, of course. It is noted that for derailment to occur it does seem to be necessary for the track to be bad; the engine will not come off good track. So there is plenty of room for discussion about how far weight re-distribution should go. On my track the burner is not quite powerful enough to keep up the steam pressure; the motor seems to consume quite a lot of steam. I am hopeful that the Roundhouse burner will deal with this as well as the noise problem. The gas tank is too large for the boiler. The last run lasted a long time, more than an hour I think, and I terminated the run prior to gas exhaustion because I was becoming concerned about running out of water. The boiler was showing signs of decreasing steam generation capacity and now I think that the top of the flue became uncovered. Which would mean that heat was getting to the water partly by conduction along the copper around the flue wall rather than directly through the flue wall. A water gauge, mentioned by someone on the G3 forum, would be a useful addition to monitor this issue. Although the usual convention of having a gas tank sized so that the gas runs out before the boiler water makes more sense at this point. 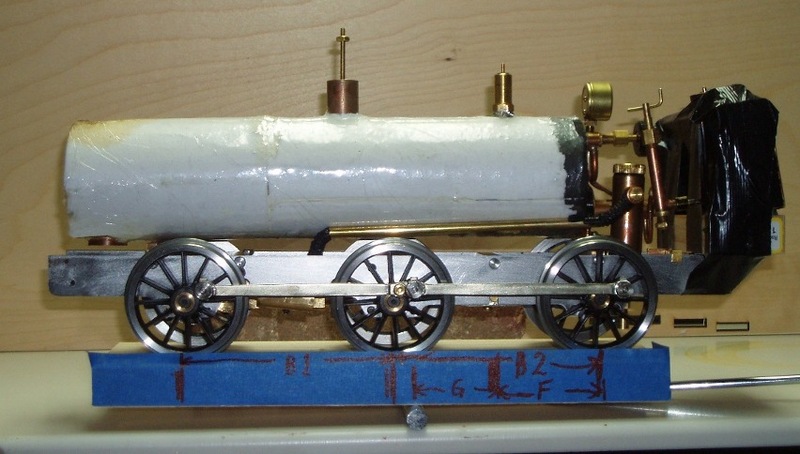 It is interesting that the boiler was built with blind bushes for boiler support and attaching the, dummy, smokebox door, but not with through bushes for water level checking or water supply during a run. This lack is not uncommon, but is disappointing, whenever it occurs. The extra cost of a couple of bushes, soldering during initial construction, and blanking plugs, is trivial. So it seems at the moment that a larger capacity burner and a smaller capacity gas tank are desirable modifications. My impression is that the engine uses a lot of gas. Well, there has been quite a long hiatus in my re-building activities - from April until November, in fact. The first reason is that I ran into trouble with my scalloped wood bridge (see an earlier image): I started to have fairly regular gratuitous uncouplings when trains were run over the scallop crests - this was with gauge 1 trains fitted with Kadee couplers. This track characteristic does not impress visitors and is a precursor of nasty crashes. So, my railway efforts went into replacing the wood bridge with a new steel bridge. Since I was doing a major replacement, also I installed a steam-up siding that I wanted but never thought would happen. The task is finished, but it has been a huge time sink. The images show the new bridge (20 feet long), the new steam-up bay, and a new junction leading to the bay. Mostly it is all new construction, although I have re-used some of the wood bridge sleepers and all the rail. 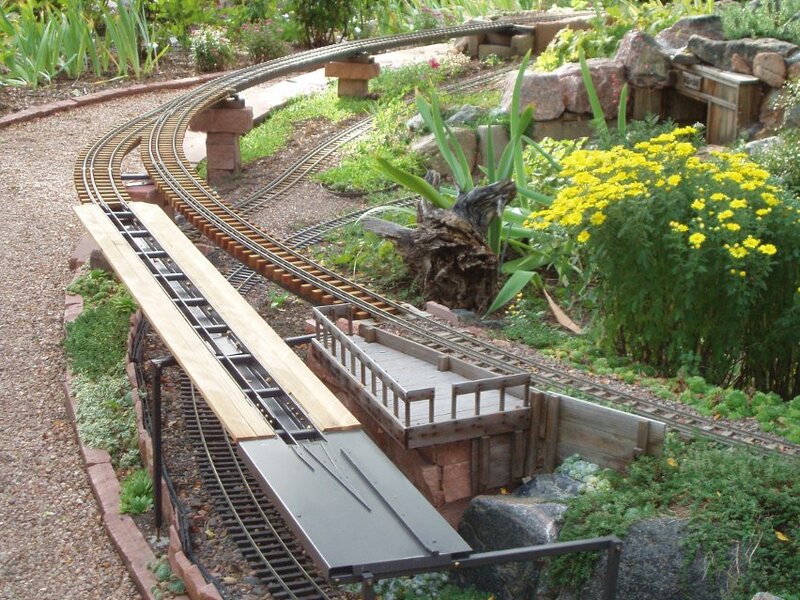 In the images the bridge itself cannot be seen very well; it is a ladder, constructed from 1 inch by 1/8 inch strip and 1/2 inch square tubing, and the track rests on it with some lateral support, superfluous really I think, which stops the track moving sideways too far. I like to say that the bridge material is hot-rolled slag with steel enhancements; however, it was quite easy to solder with 56% silver solder. The remaining task is some minor gradient smoothing. But it is all good enough for me to get back to the G3 Pannier Tank re-build that I am quite anxious to complete. A note to make is that the images immediately below were taken in September; the weather was better, but a couple of tasks had not been completed, most noticeably the junction point actuation mechanism. Other than the gradient smoothing, all these tasks are complete now, in November, and this note should explain any minor differences in images as this description proceeds. I am continuing to write largely diary-style. There is already a problem with the railer on the end on the siding - it works so well that I like to load trains into this siding; so the siding has become a train-staging area, rather than a steam up bay. And that does not work if there are engines already in place on the siding. I may have to move the railer or make another. But then, in September, I ran into the second problem that became another delay for the Pannier Tank rebuild. When the track was first laid, in 2004, it was put into a newly created, and partly raised, walled, garden. This new garden had 18 cubic feet of soil put into the raised, walled area. Now, I understood the need to tamp down new dirt, and I thought that I had done this adequately. Hmmmm. It will suffice to write that, at present, much of the original track bed is at least six inches below the surface. If anyone reading this is thinking of laying new track on new dirt, please let this be a very serious warning - unless you like re-doing jobs until you are sick of them. So it got to the point where, at the worst sink area, I ran out of width - I was unable to raise the track anymore by stuffing rock underneath it because the stones would fall out of the sides and create a real mess. The effects of the angle of repose, and aesthetic and available space considerations, demanded another solution. Which meant another bridge (but only 6 feet long this time 8-). It all looks much better, and I am glad it is (almost) done. But it took me from September to November. And there is no image because we have a storm going through today and the railway is under a few inches of snow. I started today, the Second of November. The plan is to get all the technical stuff complete, test the engine, and then, assuming success, take it apart and re-paint it, etc. On their engines, Roundhouse run a copper tube down the length of the boiler flue as a superheater. I decided to copy this method; the perceived problem being installation with the need to get a non-kinked bend at the delivery ("smokebox") end with an accessible fitting on it. This task turned out to be quite simple, much to my delight. I soldered a fitting on the cab end; annealed the other end for about four inches; put a tube-bending spring on that end; fed the tube into the flue; pushed and pulled it sideways and out of the chimney flue with a wood spatula and pliers; removed the spring; and soldered another fitting onto the end. This image shows the steam pipe installation, which is the tube with the union in it. The steam pipe feeds into the top of the motor. The other tube is the exhaust, which comes out of the bottom of the motor. Also shown is a guard that I installed to protect the motor and, primarily, the main drive gears. I plan to insulate the steam pipe. I stayed at the front, and modified the chimney a little, which has two problems. One problem is that the bottom of the chimney fouls the boiler because not enough vertical room has been allowed for it where it pokes through the false tank superstructure. So the bottom of the chimney is hard against the boiler top once the superstructure is screwed in place; the screws being remote from the chimney area. I may shim up the superstructure when I do the final assembly; I do not think that there is much more that can done. 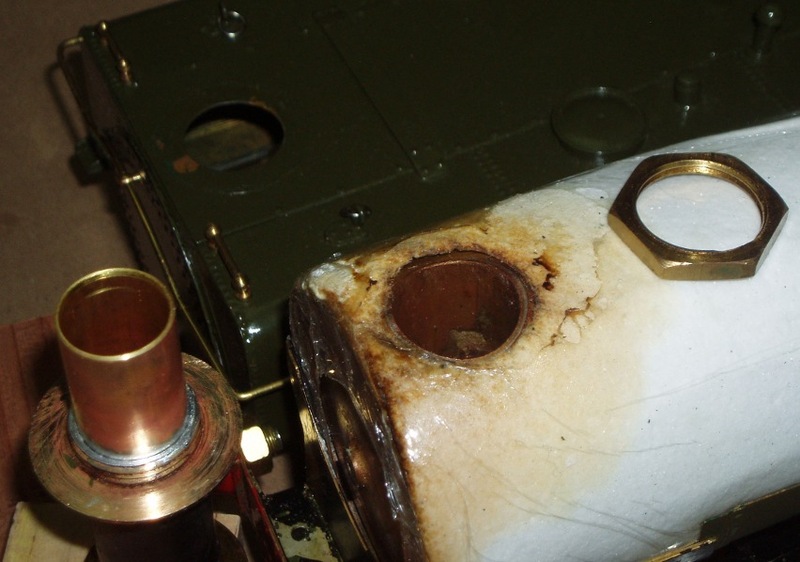 The other problem is that, as designed, steam oil that is carried up the exhaust tube and into the chimney dribbles down onto the boiler and makes a mess on the boiler. 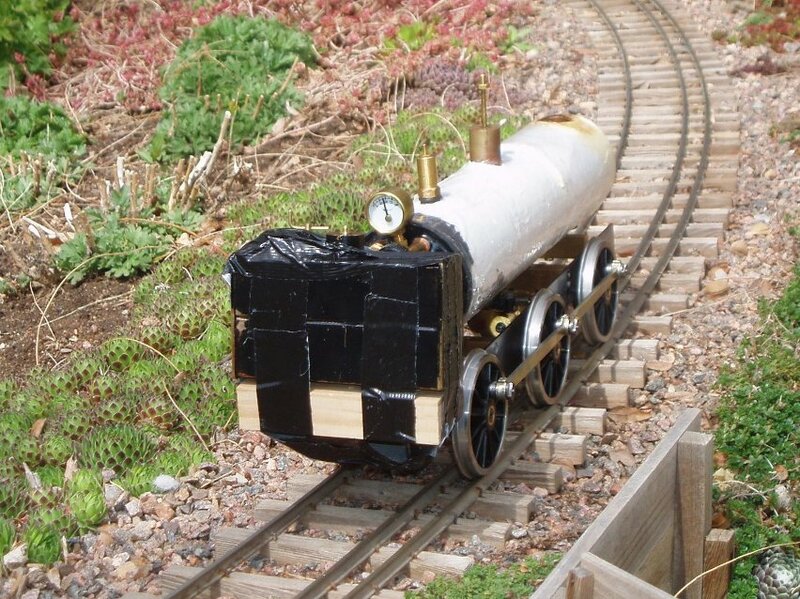 I have wrapped my boiler with ceramic sheet and so I have soggy lagging as well as an oily boiler; see the image. The real plan is that the oil dribbles down the chimney flue and drops down onto your friend's track, making it his problem. The image shows how I dealt with the oil problem. I soldered a tube into the chimney. This tube extends down into the flue past the top of the exhaust tube, which is configured somewhat like a blast pipe in a smokebox. The hope is that this chimney extension will implement the real plan for spent oil distribution, instead of making a mess of my boiler. In the image, the chimney is upside down. When installed, the chimney passes through the superstructure seen in the background, and is secured by the large nut that is then on the inside of the superstructure. The nut becomes flush with the bottom of the chimney, and together they rest hard on the top of the vertical boiler flue. There is not a lot to write about. The images show the pipework before and after installing the coal bunker/butane tank. The Roundhouse burner can be seen, also the steam-pipe entering the flue alongside the burner. 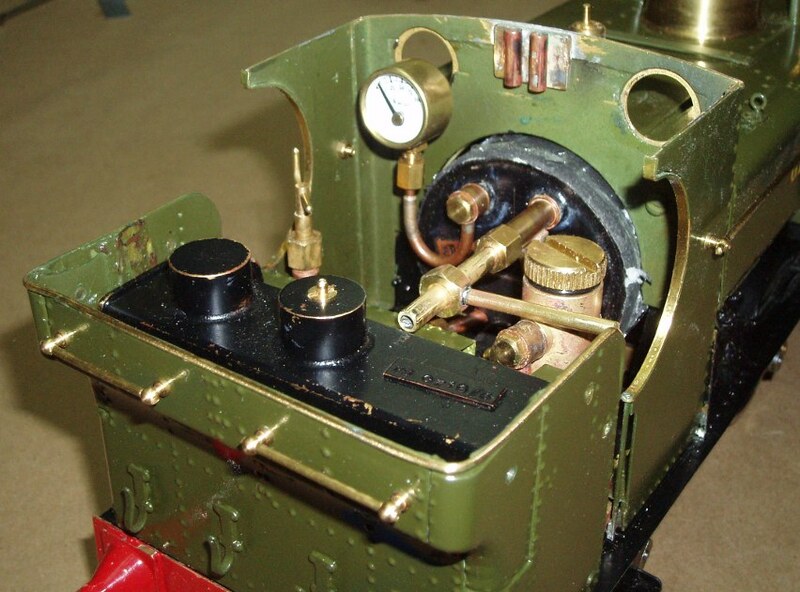 The regulator handle is temporary since no work has been done on installing radio control. The next thing to do was run the engine to find out what had worked, and what had not worked. 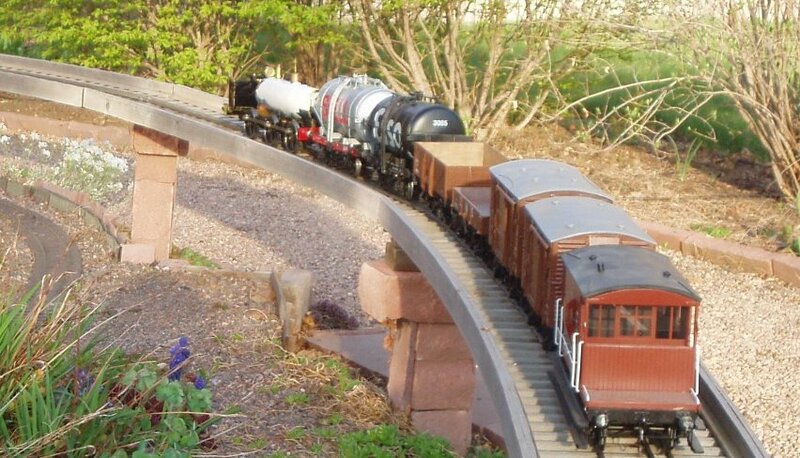 I ran the engine as before, hauling my seven waggon goods train. It was a grey day: not a lot of light; my camera struggles under such conditions. In the image the dummy smokebox door is notable by its absence; but also note that the train is going up a 1:33 gradient. The train ran as before in many ways; but there were improvements. Here is what I saw. First, it must be recorded that there was no problem with derailment. Thus I conclude that the problem recorded earlier was in my poor track, resolved by my new steel bridge. The engine ran forward perfectly well; and I forgot to run it in reverse (the weather was closing in). The Roundhouse burner may or may not have improved performance; but it did not improve the noise level; the engine still whistles. I am beginning to wonder if a standing wave is being set up in the flue. This may sound somewhat wild to some people, but the fact is that the calculation for oscillations in a half-open tube 9.5 inches long gives a frequency in air in the range of 350-550 Hz, depending on the air temperature. This puts the sound in the range from F above middle C, to C one octave above middle C; which is about right to my, not very musical, ear. I do not know what could be exciting the oscillation, but the burner could be it. When I think about it, I have heard many other engines make similar whistling sounds; but not so loudly. So, the noise is there, may be difficult to quieten, and is very obnoxious. The superheater appeared to work well. Gone was the oily water spewing out everywhere. And the engine was more responsive; just what you would expect from dry steam. The boiler made enough steam, and the engine and train settled into a steady-state, running at about 40psi with the gas setting that I chose. When I stopped the train the pressure quickly rose to 50psi and the safety valve opened. This improved performance I am inclined to attribute to the superheater; but the Roundhouse burner may have helped. 40psi may seem like a high pressure, but recall that, part of the time, this is a heavy train being hauled up a 1:33 gradient. 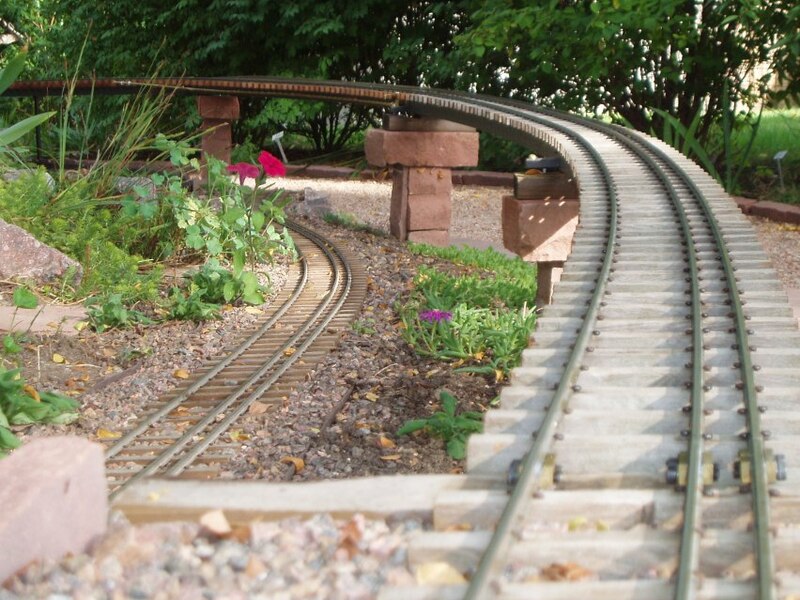 As before, there was no radio control, so the train was slow uphill, excessively fast downhill. The only significant negative item involves the safety valve, and, perversely, it concerns me for safety reasons. 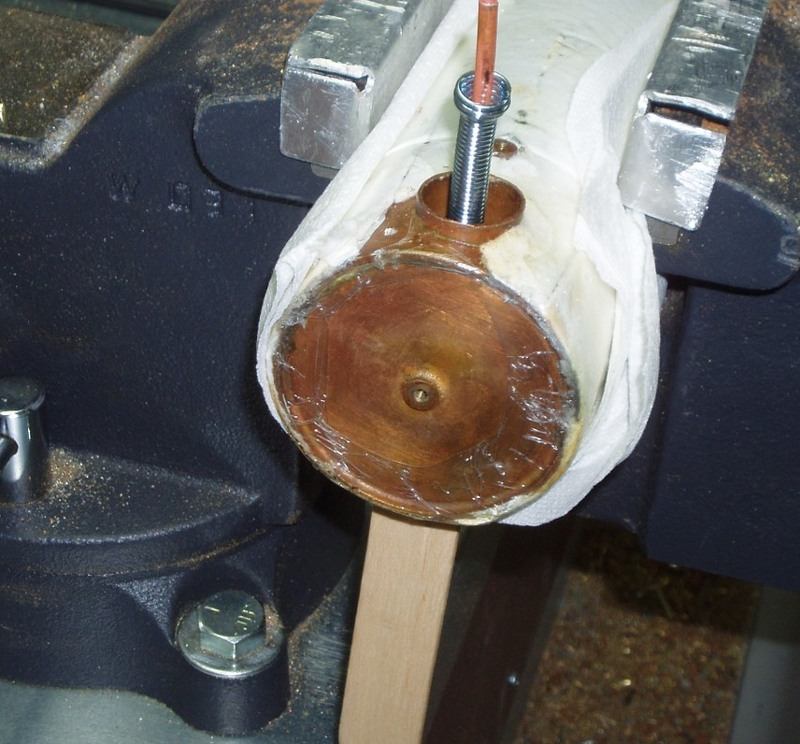 The safety valve is sealed in the boiler bushing with an o-ring. Before the run I saw that this o-ring had stretched, so I replaced it (010, Viton, 70 durometer). This seal started to leak as the pressure came up and continued to leak throughout the run. The safety issue is that failure of the seal easily could result in scalding water being thrown around. The problem is that the o-ring is not constrained by metal, only by its own strength. 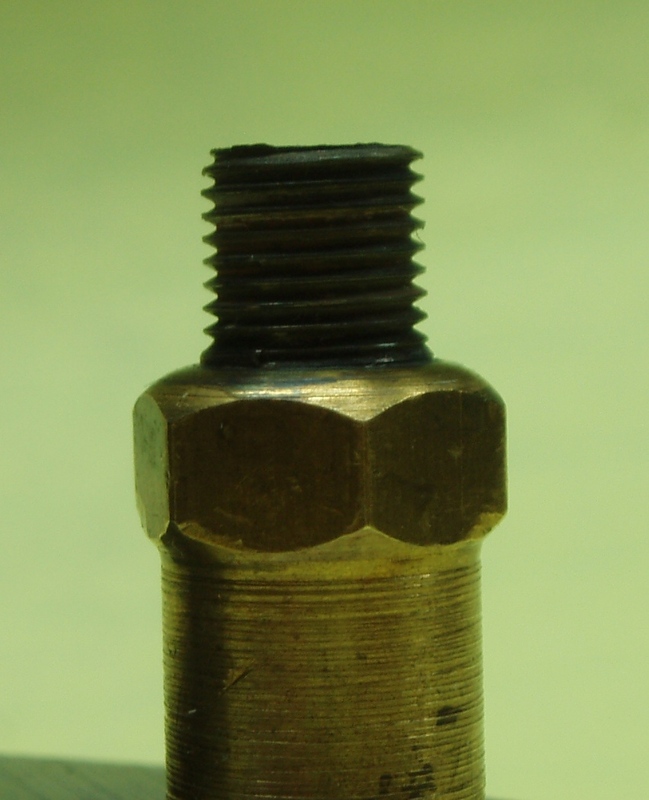 A common way of handling this kind of installation is shown in a diagram on the Roundhouse website under Technical, and then under Safety Valve: a groove can be undercut in the valve which, together with the attendant clamping pressure, provides adequate support at the relatively low pressures involved in small steam engines. In contrast, the safety valve on my engine is shaped as shown in the image. If there is enough metal in the safety valve body then I shall machine a groove in it; otherwise a change to a copper washer probably is a good idea. 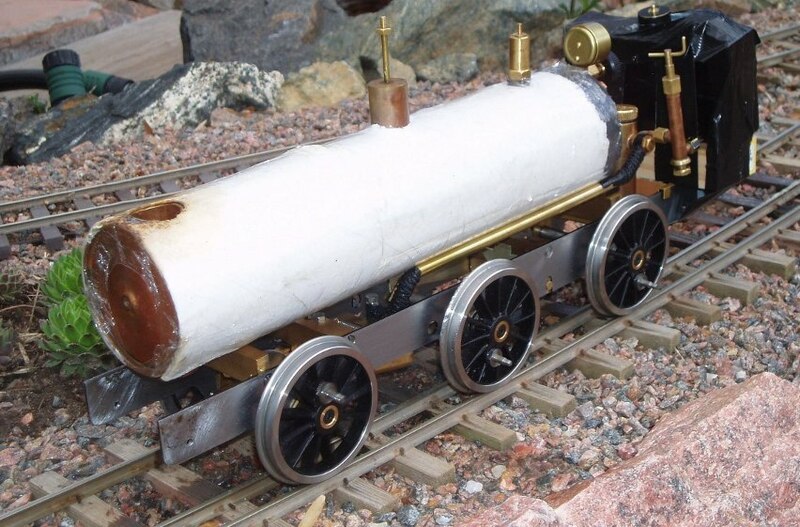 My engine runs a lot better than it did; it will start a fairly heavy train on a 1:33 uphill gradient; I have not tried it on rice pudding skins. There is more to do, for example I still want to fit radio control. But these notes already address their objective adequately. What follows is a summary of things to consider for anyone possessing one of these engines, especially if it is still yet to be built. In the text above I identified three areas to investigate: Motor Power, Derailing, and Boiler Steaming. Here I group summary in the same way, adding Miscellaneous as a fourth area. 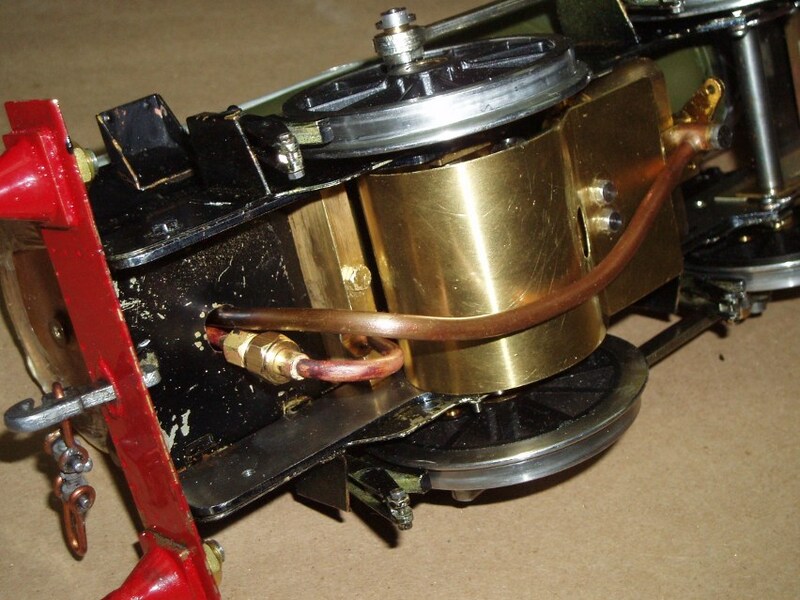 I think that other things could be done to the motor, for example the inlet and outlet banjos I suspect are a little restrictive on the steam flow. But opening the ports on my motor was completely adequate to give the engine sufficient power. 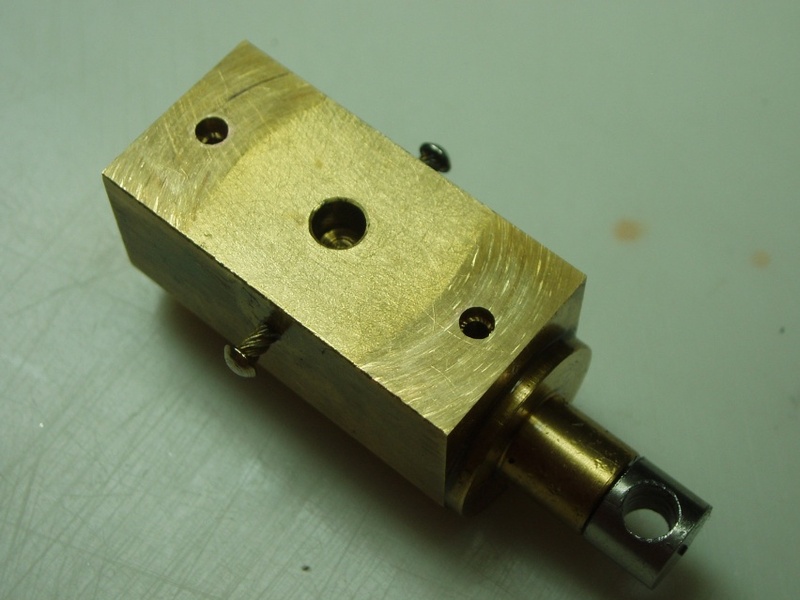 Re-working the ports is a tricky task that needs experience in machining brass. 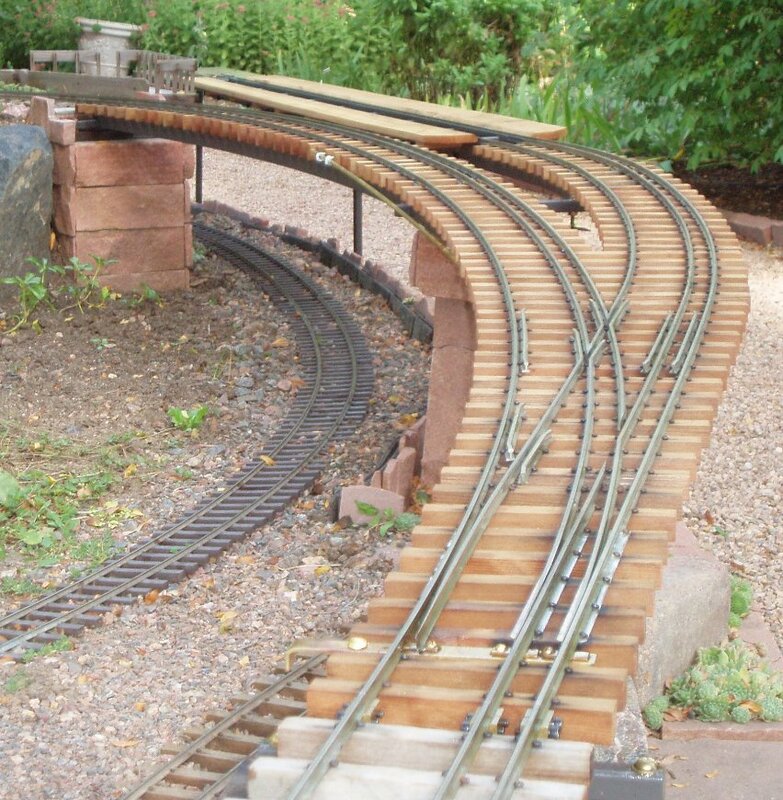 First and foremost: the primary cause of the derailing was not in the engine, but in my track. However, I do not think that it is going too far to write that the engine is more prone to derailment when going forward than when going backward. And the reason is the axle loading configuration (or weight distribution). I am still intrigued by the comment that "It derails if I allow more than 25 p.s.i. ...". If your engine does derail consistantly, try running it in reverse as an experiment. It might be instructive. If your engine does derail consistantly, check that the compensation mechanism is working freely and not adversely affecting the axle loading configuration. My engine has a different size coupling rod pin on one wheel; I have no idea how this happened; perhaps the builder did it for some reason. But it is important because of the axle loading configuration. The driving wheels are lightly loaded compared to the coupled wheels. This means that the coupling rods really have to work on this engine, unlike on many models. Fit a superheater. This certainly made the engine a lot less messy and more responsive. But, also, I think that it improved efficiency, since superheaters insert energy just where it is needed. This resulted in the boiler being able to supply enough steam to meet demand, which was a little questionable without a superheater. If you do fit a superheater, read the Roundhouse notes on steam oil. Fit a Roundhouse burner. I do not know if this is worthwhile or not. It does not solve the awful whistling noise. If you know how to baffle the flue to eliminate the noise, please let everyone know 8-). Modify the chassis and superstructure to enable simple disassembly. Steam engines need maintenance. This is far from a small task; but if you do not do it and you do need to take apart something, you will be breaking things - and then you will be doing chassis modification. For example, the assembly instructions are to fold over the horn block retaining tabs to secure the wheelsets. Thinking about unfolding thin metal tabs and then re-folding them is your homework task. 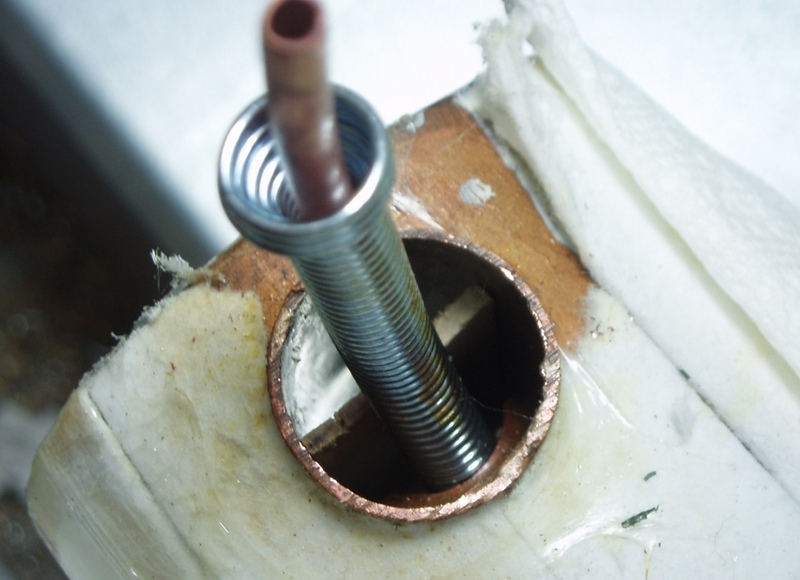 Do something about the safety valve sealing to avoid the possibility of a nasty leak. Fit radio control for realistic operation on gradients.